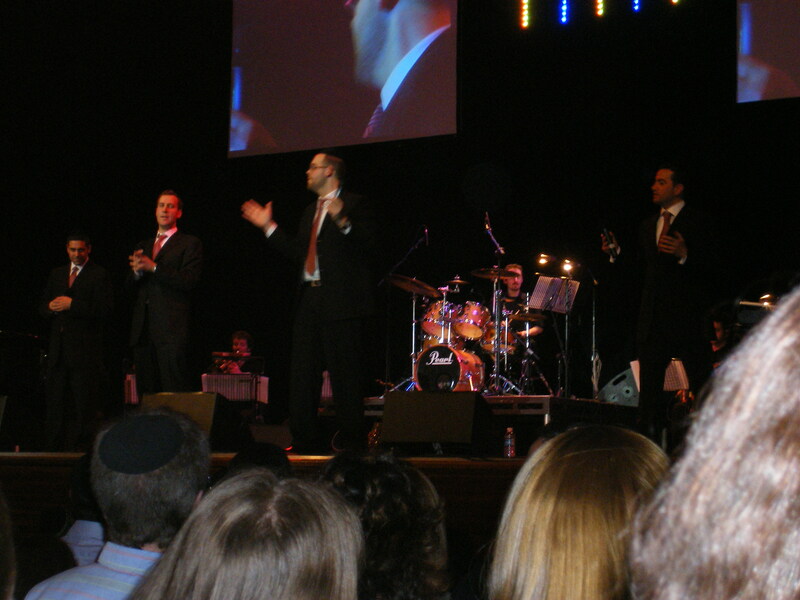 The Shalsheles concert was really nice: they sing beautiful songs well, and they also put on a good concert. The crowd was really enthusiastic and obviously enjoying themselves a lot. We were surrounded by teenagers, who were wanting to dance along, so we felt a little old, even though lots of our friends were there, as indeed were several even older people! 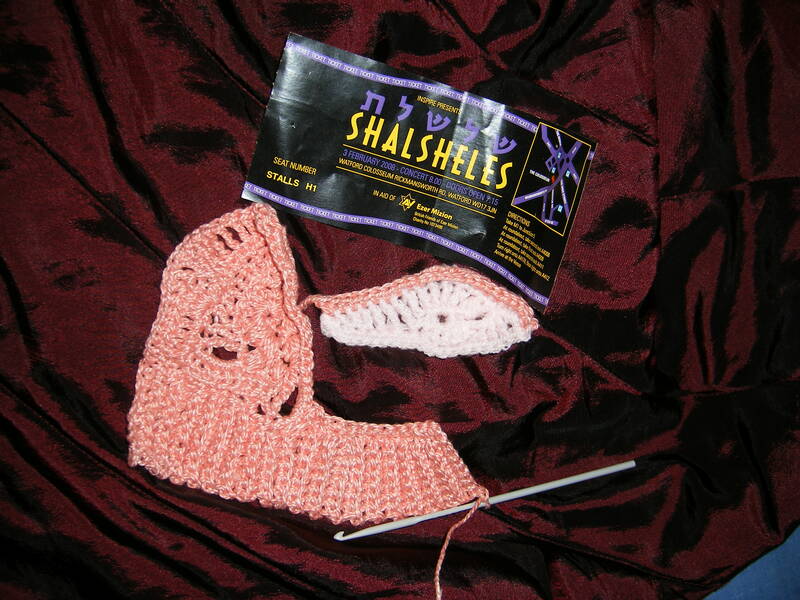 Of course I crocheted on the way there and back, and before the concert and during the interval. There was very little of the pale pink left, so I started with that, and it ended up looking like an eye, so I added a brow and then began another freeform piece with the shiny pink that I really like. I’ve decided to try making myself a pair of mitts from them, which is what the back loop ribbing is for. We’ll see how that goes. 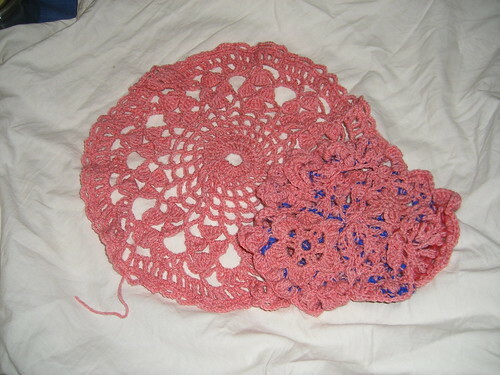 I’ve done one and a half scrumbles today, finishing the bigger one (I thought about doing more with it, but decided it’s balanced) and doing the winged one, which is my first not to be based around a previous from-a-pattern motif. I think I like them both, which is good! I’m missing working on the FrouFrou, especially as I was really hoping to finish it today. Anyone got any GGH Amelie, colourway 6, to spare? Another good haul, this time from the other charity shop on my way home. I paid three times as much, but I got the magazine rack (obviously to a far better purpose than magazines! 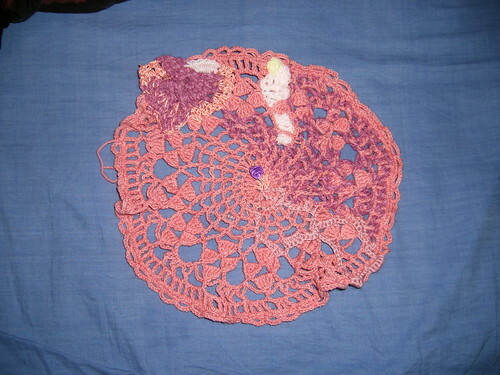 ), even more hooks, and lots of nice yarn to do some more scrumbles for the Pink Project. (There are two balls each of the grey and the peachy pink on the bottom left of the picture.) 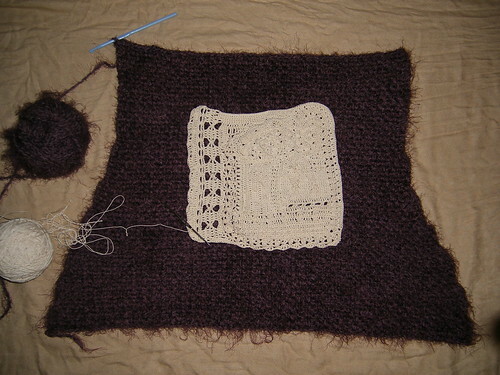 I haven’t decided yet will I use the grey as accents for that, or for teaching the kids to crochet. I now have lots of hooks for them, but not so much yarn! It’s nice to see crafts treated as art, and this book nicely does that, without downplaying at all the craft, hobby and personal expression sides of scrapbooking. That isn’t something I’ve taken up, but I do admire the best pieces as art, and all for the deeper feelings. Seeing masses and masses of pages can give a twee feeling, but I’d recommend this book as one to take a look at, whether as a scrapbooker looking for tips and inspiration, or a non-scrapbooker seeing what can be done. Right, back to getting ready for Shabbos! 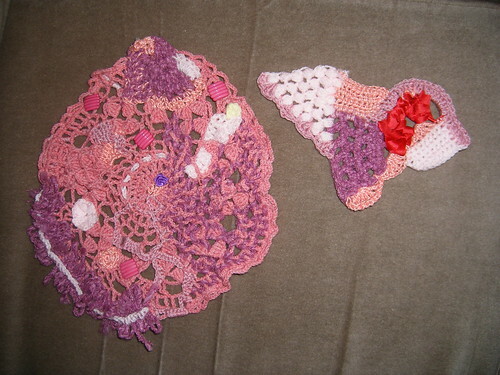 On the right (I hope they’re easy enough to distinguish) is my first completed scrumble for the Pink Project on Ravelry. At a few points in the middle I thought it wasn’t going to be very nice, but in the end I like it. The bigger piece is a motif I did a couple of years ago (the first is based on three such, by the way) which I intend to develop into a good scrumble, although it’s also possible I’ll send it in as is. I don’t have to decide yet. I haven’t done any more on the FrouFrou since Thursday, but perhaps I’ll do more this evening.